It is our great pleasure to offer you this recipe and help you to re-create what you experienced with our paella catering experience. Cooking paella on a Sunday afternoon with friends around is the ultimate relaxing experience. The key elements are the ingredients! Use good quality paella rice, fresh seafood and the most important an excellent chorizo. Add the chicken wingettes, season with salt and the pepper and cook until browned. Remove from the pan. To make the sofrito, add the onion, garlic, tomato paste and diced capsicums to the pan and cook until softened and slightly browned. Add the chorizo and calamari cook for 7 minutes. Taste and season salt, pepper & paprika – With salt (up to 1 tbsp) the mix must be over salted before adding rice. Add the saffron on top of rice and stir for 30 seconds until rice colour have change to red. 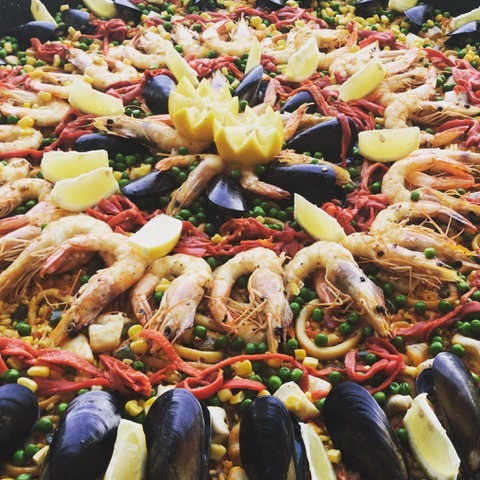 Make sure the mix is perfectly flat and even everywhere in you paella pan! Add the stock about 2cm above the rice and simmer for 10 minutes. Continue simmering until the stock has evaporated and the seafood cooked. Chef tips! You can cover with foil to accelerated the process and use less stock. While the rice is still slightly firm, increase the heat to high, and cook for 2 minutes until you hear the base of the pan sizzling to create the soccarat (brown crusty bottom) on the paella. Turn off the heat, squeeze over half the lemon and garnish with lemon wedges. Cover with a clean tea towel and rest for 10 minutes before serving. We aim to return a quote to you within 24 - 48 hours. For all the latest news, including free recipes and so much more!